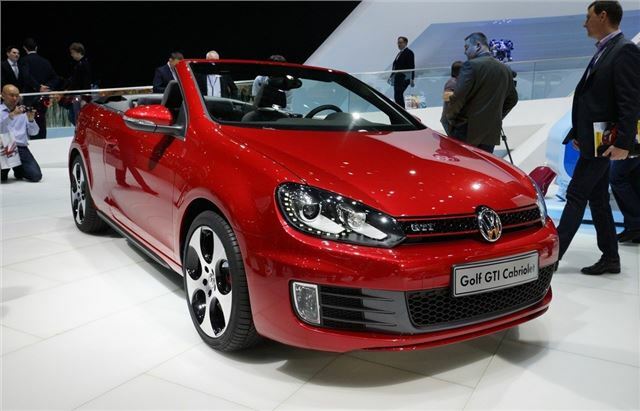 Volkswagen introduced a GTI version of its Golf Cabriolet at the Geneva Motor Show. It will go on sale in the UK in September and prices are expected to start at more than £27,000, making it the most expensive model in the Golf Cabriolet range. It features all the traditional GTI styling cues, like a honeycomb grille with red surround, and a wider stance, and new side sill extensions. A rear diffuser, 17 inch alloy wheels and smoked rear lenses complete the look. Power comes from the same 2.0-litre turbocharged engine that is fitted to the GTI hatchback. Maximum power is 210PS, with a 0-62mph sprint time of 7.3 seconds – 0.4 seconds slower than the hatch. Top speed is 147mph, or 146mph with the optional DSG gearbox. Peak torque is 280Nm available from 1700rpm. In the cabin the Golf GTI Cabriolet features traditional tartan upholstery, with a leather steering wheel, gear lever and handbrake, all embellished with high contrast red stitching. Leather seats are an optional extra. As with all Golf Cabriolet models, the GTI comes with automatically deploying rollover protection, front and side head/thorax airbags and a driver’s knee airbag as standard.